The illuminated Saint John’s Bible, Book of the Gospels & Acts, on tour in our Archdiocese in early 2018, is a wonder to behold! The great beauty of its illuminations speaks to the honour that we should always give to the Word of God in the Holy Scriptures. Set in a vibrant modern art style with such rich symbolism, it invites us to stop, to reflect, to pray and especially to listen, always attentively listen, as God reveals his unending love for us. 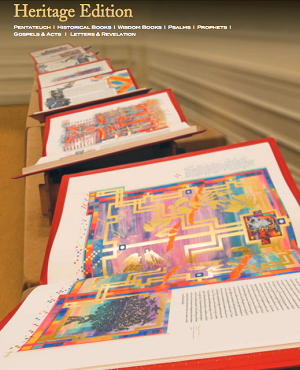 The Saint John’s Bible was commissioned by Saint John’s Abbey and University of Collegeville, MN and was created by Donald Jackson, Senior Scribe to Her Majesty Queen Elizabeth’s Crown Office, along with a collaborative team of scribes and artists. This is the first illuminated, handwritten Bible of monumental size to be commissioned by a Benedictine monastery in more than 500 years. All 73 books from the Old and New Testaments using the New Revised Standard Version are presented in seven volumes of approximately 1,150 pages. The work of The Saint John’s Bible was done in a scriptorium in Wales. Now complete, Saint John’s University is the Bible’s home. The Saint John’s Bible was made using traditional materials such as vellum (calfskin), ancient inks, gold and silver leaf and platinum, and was written with quill pens fashioned from goose, turkey and swan feathers. An extension of the original work, the Heritage Edition is the only full-size, limited, signed and numbered fine art edition that will ever be produced. In all, 299 fine art editions have been created and placed in religious, arts, academic, healing and literary institutions around the world. 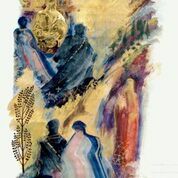 Why Is the Saint John’s Bible in Our Archdiocese? Volume 6 of the Saint John’s Bible: Gospels & Acts, is here to help us celebrate the Coming of the Gospel in Western Canada, 200 years ago. A committee has been tasked with defining a process and outlining a program so that as many people as possible may see the Saint John’s Bible during the 2018 Bicentennial Year of the Archdiocese.